Indian enterprises will adopt intent-based networking in the future as the technology landscape changes rapidly buoyed by the digital transformation wave in the country, a top executive from US-based technology services and products company Cisco India said at a summit. However, this shift in strategy will not take away jobs, VC Gopalratnam, Cisco India’s chief information officer and senior vice president of IT, added. “Today, the network connects everything and all deliveries are done by the cloud. 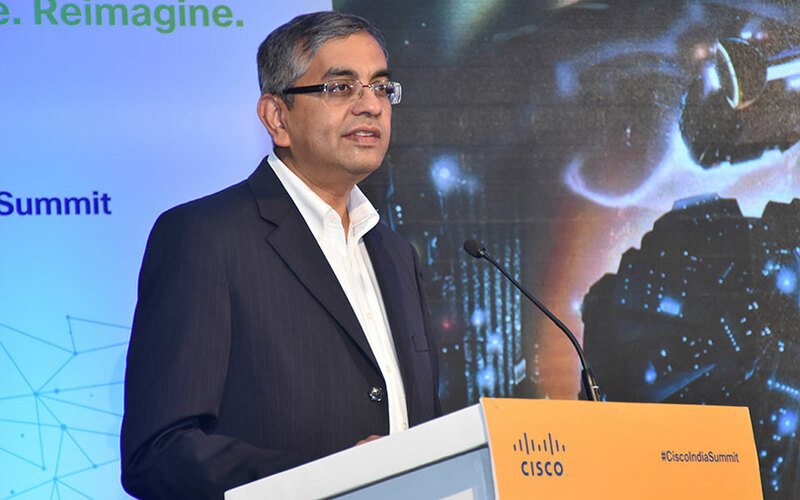 Earlier, we spoke about context-aware networking, but today, as the needs of enterprises are shifting, they will soon start adopting intent-based networking," Gopalratnam told TechCircle on the sidelines of a Cisco India summit. The CIO added that the best example of context-aware networking, which is built on the principle of who, when, where and what, is the personalisation of the workspace. "Once an employee enters the office and swipes his card, the entire tech stack aligns to that particular employee,” he explained. In contrast, intent-based networks focus only on the business outcome. By capturing business intent and activating it network-wide, businesses can bridge the gap between their needs and what a network can deliver, Gopalratnam explained. He added that Cisco's intent-based networking services are based on four pillars—policies, automation, assurance and security (PAAS). According to him, enterprises can segment the network for different customer bases and their needs. "Let us take video services for example. If Sameer (Cisco’s India head) was on a video call in the other room with the prime minister, and I and my colleague were on another one in the next room, then using intent-based networking, we can set a policy that since a more important call is going on, the network will automatically supply more bandwidth for Sameer's call," he explained. He added that another manifestation of intent-based networking is blockchain, which brings together data, networking, cloud, security and application programming interfaces (APIs). "One of the best examples is the use of blockchain by hospitals to track electronic medical records of patients. India has huge potential to use blockchain and I see it really taking off in the next four to five years," the CIO said. In June 2017, Cisco launched its first intent-based networking service that included its DNA Center and software-defined access architecture. DNA Center is a centralised management platform that lets IT teams put intent-based operations into action. The product can also manage hardware and software lifecycles to keep routers, switches, access points and other infrastructure up to date. On data and analytics, Gopalratnam said that data generation and management was changing fast for enterprises. "Earlier, data was just being generated in the company. Then it started being generated at devices or near the customer bringing in serverless or edge computing. But now we are talking about data being generated throughout the enterprise tech stack, right from the data centre to the customer," he said, adding that this makes analytics at all points very important for enterprises. However, he warned about the quality of analytics. "Most CIOs and Cisco follow the three Vs of analytics—volume, variety and velocity. But now there is a fourth V—veracity. Since AI models are used for analytics data, veracity becomes very important especially when these AI models are easily hackable,” he said. On data security, Gopalratnam said Cisco was moving on from earlier security assessment models to continuous vulnerability assessment models. The company was also looking to understand the impact of General Data Protection Regulation (GDPR) in data security standards, he added. Besides, with the change in the threat landscape, a new industry vertical called cyberinsurance is slowly growing. On automation and artificial intelligence, the CIO said that the auto industry has taken the lead in the space and most other IT companies are at level 1 or 2 of their automation journeys. “We clearly need to move towards infrastructure where there is self-diagnosis, self-configuration and self-management, self-protection, self-optimisation and self-healing,” he said, citing Netflix as an example, where the streaming service voluntary took down some parts of its tech infrastructure to see how the entire stack responds. He also said that there was a huge demand for chatbots and affective computing. "Affective computing is a branch that adds emotions to bots which are sometimes called woe bots,” he explained. Last year, Cisco had released its first voice-based AI assistant called Spark for enterprises. It leverages deep-domain conversational AI technology from startup MindMeld, which Cisco acquired in May 2017 for $125 million. He also said that companies were looking to create skill bots, which would look for talent for particular projects internally or externally. Gopalratnam believes that AI and automation will not take away jobs but will help human beings operate at a higher level. "There is a new concept call artificial stupidity which looks at achieving AI or machine intelligence through a series of manageable steps. We are far away from actual machine intelligence," he explained. The world is moving towards the humanisation of IT, which explores how employees can work with machines, the CIO said. This move will lead to the creation of algorithmic CXOs who will make decisions based on data and analytics.